Hergest Croft Gardens01544 230160work GardenHergest Croft Gardens lies in the heart of the Welsh Marches. Set in 70 acres, the Gardens are internationally renowned with a spectacular collection of trees and shrubs as well as gorgeous flower borders, an old fashioned Kitchen Garden – all for you to discover, enjoy and relax in. With Plant Sales, Gift Shop and Tearooms, the Gardens are the perfect place to explore. Award winning Ridgeway Catering run the Tearooms in the Dining Room at Hergest Croft Gardens, specialising in local homemade food. With stunning views towards the Black Mountains, the Gardens have spectacular spring and autumn colour. Over the last 120 years, four generations of the Banks family have created them which extend over 70 acres, contain more than 5,000 rare trees and shrubs planted in over six distinct areas. They hold the National Collections of maples, birches, and Zelkovas as well as over 90 ‘champion’ trees. Begin exploring Hergest Croft with a visit to the Conservatory with its display of many tender species. Move onto the Lower Terrace where a striking blue and white late-summer border has been created recently. The large Rockery has been renovated; and the new Slate Garden features edging in six varieties of box. 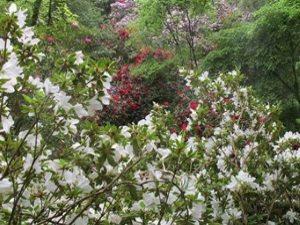 the Azalea Garden has an impressive collection of azaleas combined with a huge variety of exotic trees. The Maple Grove started in 1985 contains many new plants, mainly introduced from the Far East. In addition to a traditional vegetable garden, the Kitchen Garden features a Spring Border under an avenue of ancient apple trees, next to a long and double Herbaceous Border. There are also Iris and Rose Borders. A walk through the Park with its magnificent collection of specimen trees leads you to Park Wood, This secluded valley, hidden deep in an ancient oak wood, contains over 30 acres of giant rhododendrons and exotic trees, creating a Himalayan scene that will amaze and delight you. Hergest Croft Gardens lies in the heart of the Welsh Marches. Set in 70 acres, the Gardens are internationally renowned with a spectacular collection of trees and shrubs as well as gorgeous flower borders, an old fashioned Kitchen Garden – all for you to discover, enjoy and relax in. Disabled Access: Disabled facilities are provided but some areas of the Gardens are not accessible to wheelchairs. The Historic House Association: members and friends FREE except during the Flower Fair and Plant Fair. Follow the brown signs locally.